Cliché Magazine is a digital magazine, based in Los Angeles and Las Vegas, that covers such topics as fashion, music, culture, and entertainment. The publication is released monthly, in virtual formats only. The magazine was founded by former editor in chief Jeremy Fall, and premiered on June 1, 2009. Fall founded Cliché at age 18, initially as a side project while he was working as an event producer. According to Fall, the magazine reached 1 million unique views in December 2009. On June 1, 2011, after a year-long hiatus, the magazine was relaunched in a new format that allowed for audio and video embedding. Head photographer Dirk Mai produces cover editorials, as well as other exclusive content for the magazine. Richard Corbett became the new proprietor of Cliché in December 2011 and Megan Portorreal took the reins as editor in chief of the magazine In October 2012, Wilson Greene joined the Cliché Team  as a Managing Partner and COO. Responsible for managing the day-to-day operations and to provide strategic direction for the company. In May 2012, Cliché added Quavondo Nguyen to their team as Creative Director. With a design and photography background, Quavondo was able to help provide creative insights to help the company re-brand its product. In the Summer of 2013, Cliché Magazine relaunched with a new identity, including a new logo, a new website, and a new magazine look and feel. Quavondo is also the head photographer. In December 2009, the magazine released its "Print is Dead, Get Over It" campaign. In line with its eco-friendly mission, and in light of the online publication boom, Cliché offers print issues on demand. In addition to its website, Cliché is also available as an iPhone and iPod touch application. Furthermore, its August 2009 issue – titled "The Green Issue" – focused on providing environmental conservation tips, as well as highlighting eco-friendly brands such as Tom's Shoes. In addition to the magazine, Cliché used to run the blog Hello Kitsch, which was presented in a daily format and included additional, more personal content between issues. Now all blog posts can be found directly on the site. Cliché TV, was created as a way to promote Independent Artists, Showcase Webisodes, Models and other Video Related Projects. 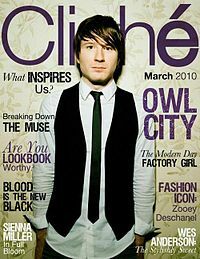 Cliché's covers have featured a wide range of appearances, including Noureen DeWulf, Sarah Rafferty, Vanessa Marano, Fiona Gumbelmann, Brittany Flickinger, Mandy Jiroux, Tiësto, actress Torrey DeVitto, fashion designer Jeffrey Sebelia, Adam Young of Owl City, Normani Kordei of Fifth Harmony and alternative band The Maine. ^ a b "WeTheUrban". WeTheUrban. Archived from the original on October 6, 2011. Retrieved October 21, 2011. ^ "Catching Up with the Editor-In-Chief of Cliché Magazine | Fidoo Stream". Stream.fidoo.com. Archived from the original on October 12, 2011. Retrieved October 21, 2011. ^ a b "THE MAN BEHIND THE MAG: Jeremy Fall, Editor-In-Chief Of Cliché Magazine". FashionIndie. September 1, 2009. Archived from the original on October 4, 2011. Retrieved October 21, 2011. ^ "Maintenance Mode". Your Daily Thread. Retrieved October 21, 2011. ^ Steve Smith. "GQ, Other Conde Titles to Launch iPhone Editions". MinOnline. Retrieved October 21, 2011. ^ a b "FIRST LOOK: Cliché Magazine's "Behind The Scenes" Issue". FashionIndie. October 30, 2009. Archived from the original on November 3, 2009. Retrieved October 21, 2011. ^ "Secretdir.com". Hellokitsch.com. Retrieved October 21, 2011. ^ "TV |". Clichemag.com. Retrieved January 21, 2014. ^ "Former Paris BFF Finally Talks About Split – Celebs News". Starzlife.com. Retrieved October 21, 2011.